THE NIGHT IS TOO SHORT. leisure, whether it’s at the table, the next bar, or on the cab ride home. Download TabbedOut and feel like a VIP wherever you go. "Now when it's time to go, you can pay up and get out whenever you like. You can even pay your tab before you get your food." TabbedOut makes it easy to get another round on the house with our Refer a Friend program. For every new member you refer to TabbedOut we'll give you $10 off your next tab, refer as many people as you want. SHARE YOUR CODE: You can share your unique code via Facebook, Twitter, Instagram, email, SMS or... pass it to someone on a Post-It note! Your unique code will never change. You can refer as many people as you want. There is no limit on the number of rewards you can earn! ENTERING PROMO CODES: New users can enter a promo code while setting up their account, or afterward. To enter it after account setup, go to the profile menu and click "Enter Promo Code." WHEN DO YOU GET PAID? 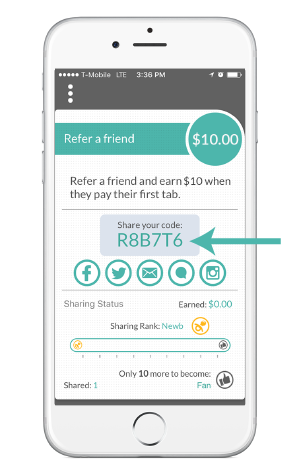 Once a new user who entered your referral code has closed their first tab, you will receive $10 OFF your next tab, and the new user will get $10 OFF their first tab!